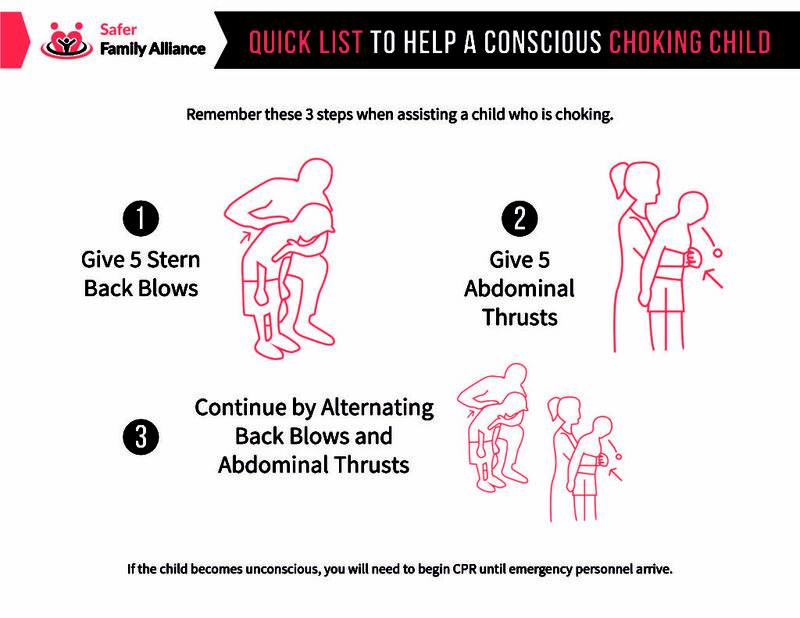 With a child choking, assess the situation to determine what is causing the obstruction, then proceed with 5 back blows and 5 abdominal thrusts. Perform this on a conscious child similarly to what you would do with an adult only with less force. If the child becomes unconscious, begin CPR. Always call 9-1-1 in emergency situations. With any emergency situation, check the area around you to confirm it is safe to proceed with care. If not, take measures to evacuate and wait for help. If it is safe to proceed, evaluate the child to see if there are any indications to why the child is choking. Maybe he was playing with crayons or eating cherries. The more information you can gather helps you and emergency responders when they arrive to provide appropriate care. If the child becomes unconscious, you will need to begin CPR until emergency personnel arrives. Use the heel of your hand to perform the back blows (the soft bottom part of the front of your hand). To get the child in the proper position, stand behind the child. For small children, you can kneel. Place one arm across the front of the child’s chest to support them during the back blows. Bend the child forward from the waist so their airway is at least parallel to the ground, if not facing downward. Between the shoulder blades, give five distinct back blows firmly. Pay attention to see if the item becomes dislodges. Still, from behind the child, wrap your arms around his or her waist. With your thumb, locate the navel of the child. Make a fist just above the navel and put the other hand over the fist to help control the thrust. Your fist should be above the navel but below the bottom edge of the breastbone. Give 5 quick thrusts pulling in and up at the same time. The goal is to create as much thrust as possible from the air within the child’s lungs to expel the object obstructing breathing. If the obstruction isn’t dislodged but the child is still breathing, continue to do 5 back blows followed by 5 abdominal thrusts. This process continues until the child is able to cough the item out, it becomes dislodged or the child falls unconscious. By alternating from back blows to abdominal thrusts, you essentially continue to shake things up from different angles that could help dislodge the object. The infant starts forcibly coughing. The object becomes dislodges and is forced out. If the child is turning blue and begins to pass out, this is an indication that no oxygen is getting past the obstruction. From your position behind the child, you should be able to catch them and gently bring them down to the ground if they lose consciousness. The international sign for choking is when someone holds their throats with a shocked look on their face. Coughing and wheezing are other signs that someone is in distress perhaps form choking. Someone not getting enough oxygen will likely start to panic and you will notice a bluish tone in skin color, lips and fingernails. Don’t assume a child is choking just because he is coughing or wheezing. Children should be able to communicate with you and nod ‘yes’ or ‘no’ if they are asked: Are you choking? Seek permission from a parent or guardian to treat and give aid to a child that isn’t your own. It is possible that a child isn’t choking on an object at all but is instead having an allergic reaction. Potential causes of allergic reactions are bee stings, bug bites and certain foods. Someone having an allergic reaction may have tongue swelling, hives and throat swelling, ultimately leading to potential anaphylactic shock. This is an allergic reaction causing the throat glands to swell and close and treated with an epinephrine injection. Back blows or abdominal thrusts won’t resolve this issue. Proceed to an emergency room or wait for paramedics to arrive. If you know your child has serious allergies, seek a prescription for an epinephrine pen. Epinephrine pens (sometimes referred to by the brand name Epi-Pen) is a self-injection tool that is pre-loaded with the right prescription dosage for your child’s height and weight. By pressing the pen against the thigh, even though clothing, and pressing the injector button, a needle safely and quickly administers the medicine. Immediate medical attention is required after any epinephrine pen injection. The heart must be monitored and the overall condition observed overnight. Children are notorious for putting things in their mouth. It is one way they explore the world. Many things are not suitable for ingestion and can become serious choking hazards. Don’t let children run around while snacking. Keep playtime and eating time separate. Always keep an eye on children when they are eating or playing with toys that could be choking hazards. Teach children good eating habits that include thoroughly chewing food before swallowing and speaking only when there is no food in their mouth. It is as much etiquette as it is a safety precaution. The best way to prevent child choking is to teach children good eating habits such as chewing food well, not playing when eating and keeping food at a table. 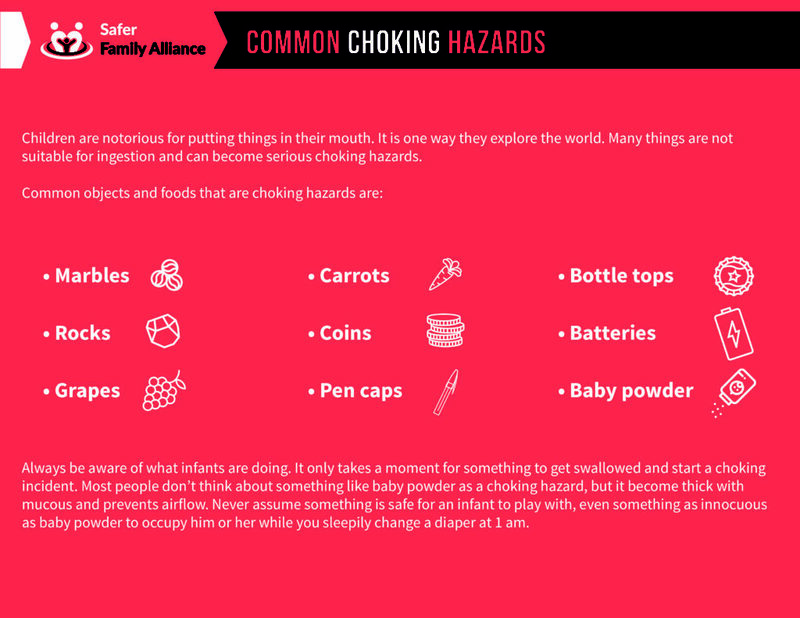 Always be aware of potential choking hazards children are playing with or exposed to. A watchful eye has prevented more than one child choking incident. Looking for more information on Infant Choking or Infant and Child CPR. Visit our resource center. This is very helpful I’m going to save it. Thanks for sharing ? ?